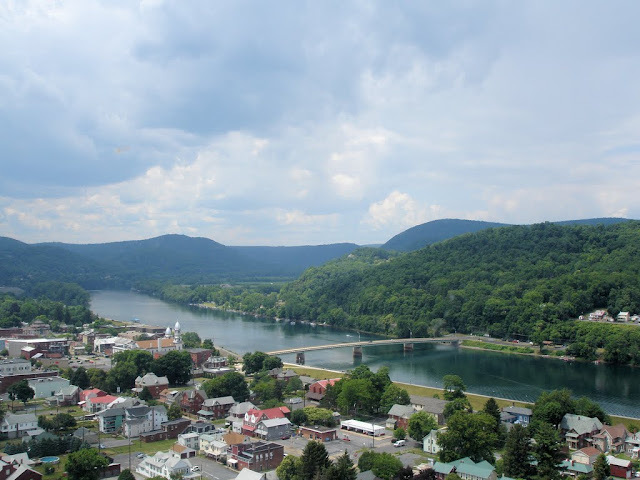 I decided to attempt another trip to Lock Haven, Pennsylvania, the former headquarters of the Piper Aircraft Company. When I called the museum this time, I spoke with a living human being and obtained explicit confirmation that the museum would be open. Though my drive to the airport was under a cloudless sky, the cumulus clouds were building enthusiastically as I climbed away from Le Roy and turned southbound to Lock Haven. 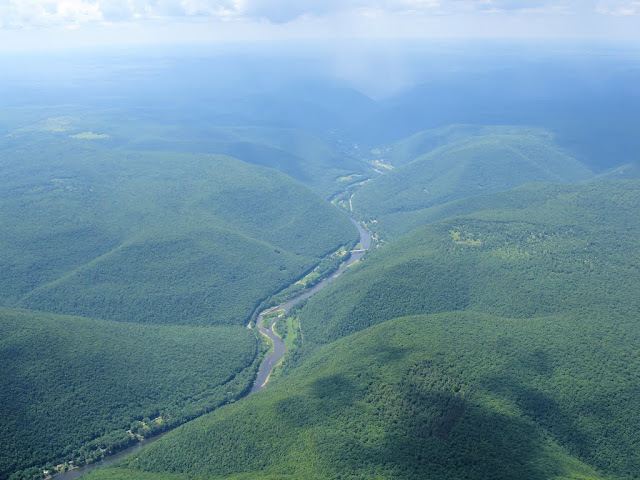 This photo was taken from 9500' near the Grand Canyon region of Pennsylvania. 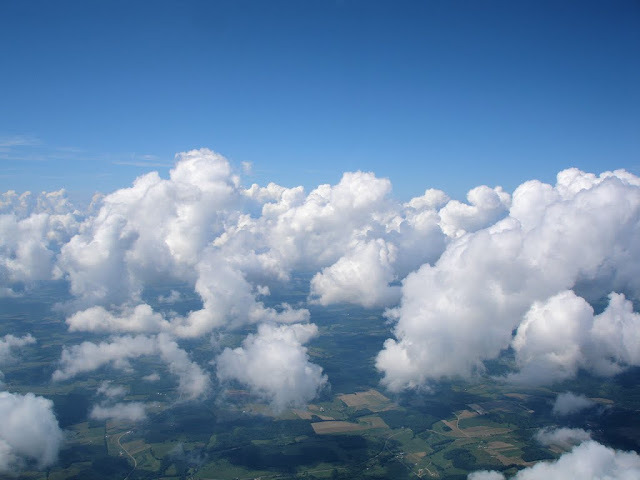 It was one of several buildups that forced a meandering course to my destination. 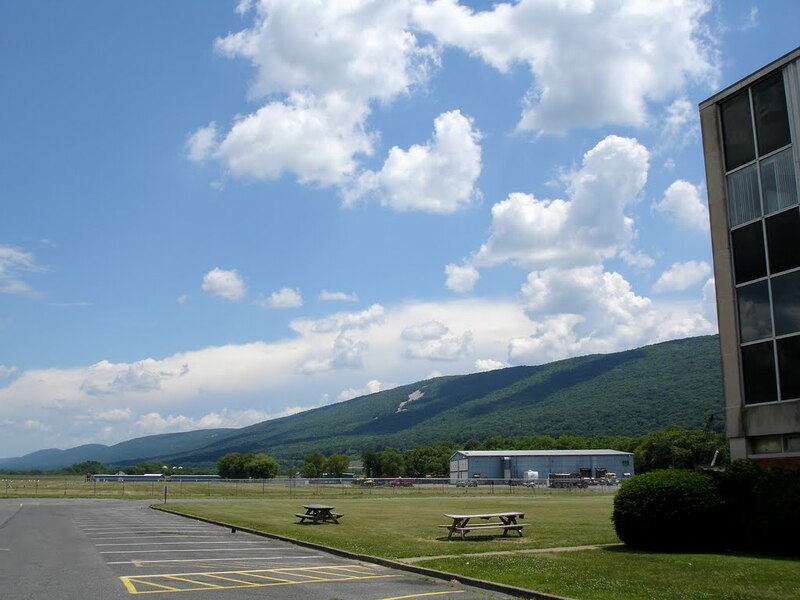 William T. Piper Memorial Airport is situated along the Susquehanna River on the eastern edge of Lock Haven, Pennsylvania. 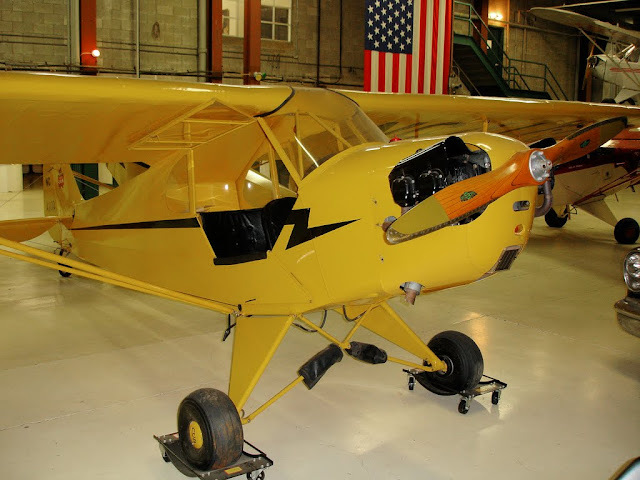 After buying out Taylor (of Taylorcraft fame), Piper moved the aircraft company to Lock Haven from Bradford, PA. The large structure in the lower right hand corner of frame is the old Piper factory, converted from a silk mill that already existed on the site. Upon my arrival, Ed Watson shuttled me over to the Piper Aviation Museum in a white Caprice Classic crew car sporting the bear cub logo from Piper's pre-Cherokee days. This photo was taken looking east from the front of the Piper Aviation Museum. What a breathtaking day! Situated in the former Piper engineering building, the Piper Aviation Museum is a modest affair. But it has a few noteworthy exhibits. Among them, this one of a kind PA-29 Papoose, a 1962 prototype aircraft. 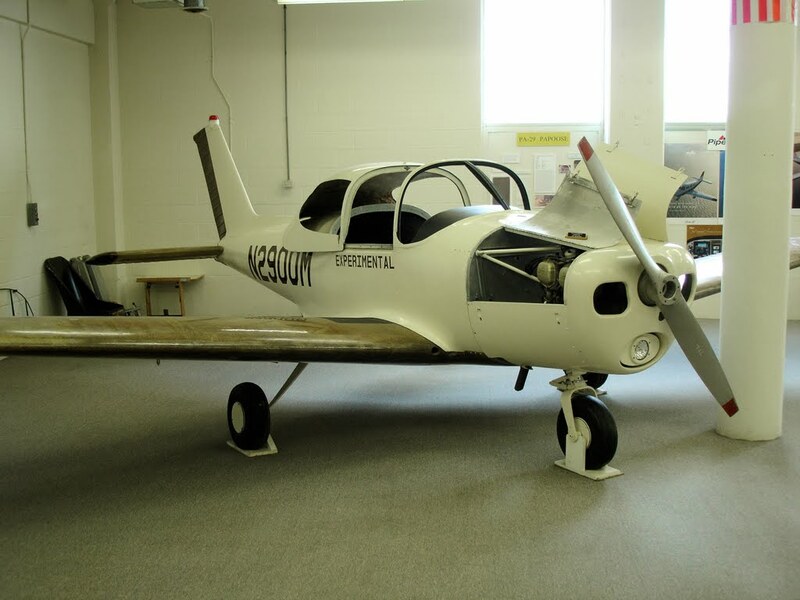 Borrowing aspects of the Cherokee design (note the cowling and stabilator) this two seat experimental featured a fiberglass airframe and a sliding canopy. It was ambitiously innovative for its time; perhaps too much so. The FAA would not certify it. It would be sick and wrong NOT to take a photo of a J-3 Cub while visiting the Piper Museum, so here's the obligatory photo. A beautiful airplane and, for me, symbolic of a simpler time when light aircraft operated off of turf runways without concern for temporary flight restrictions, threats of user fees, and a distrustful general public. Visitors to the museum will find this J-2 Cub, the progenitor of the venerable J-3, hovering above the other exhibit aircraft. Another noteworthy Piper Museum exhibit is this PA-12 Super Cruiser, "City of the Angels". 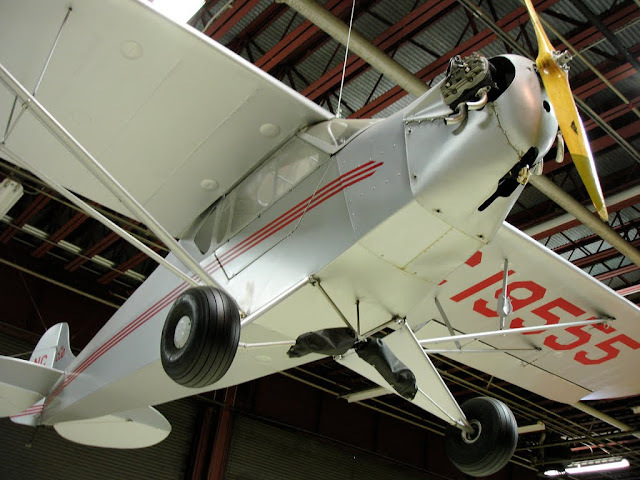 Along with its sister ship, the "City of Washington" (on display at the Smithsonian Air and Space Museum), this aircraft flew around the world in 1947. 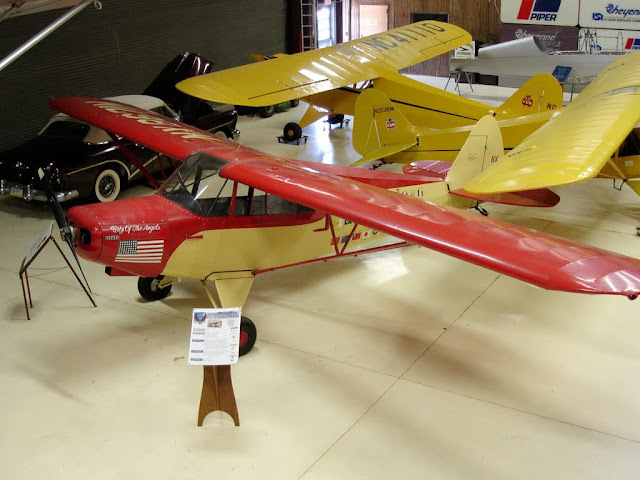 The "City of the Angels" was the lead aircraft in the flight of two and is considered the first light aircraft to be flown solo completely around the world. With my visit to the Piper Museum complete, Ed returned to drive me back to my airplane. We diverted through town for lunch and Ed gave me a bit of a tour / history lesson on Lock Haven. I was amazed when Ed offered me a cash loan in the event that the restaurant did not accept credit cards. I can honestly say that I have never experienced such red carpet treatment at any airport I've ever visited. 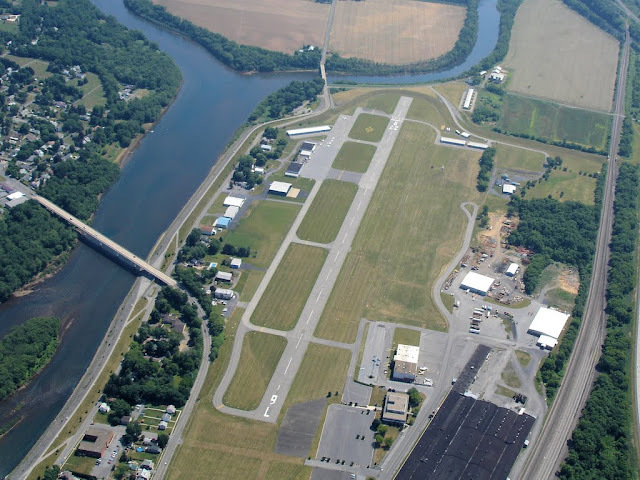 The photo above was captured while climbing away from runway 27R, paralleling the Susquehanna. The clouds that had begun building on my journey to Lock Haven dominated the Pennsylvania sky by the time I departed. Some of them were producing light rain, as can be seen at top center of this photograph. Though I flew through some light rain on my way home, I dodged the denser rain shafts. 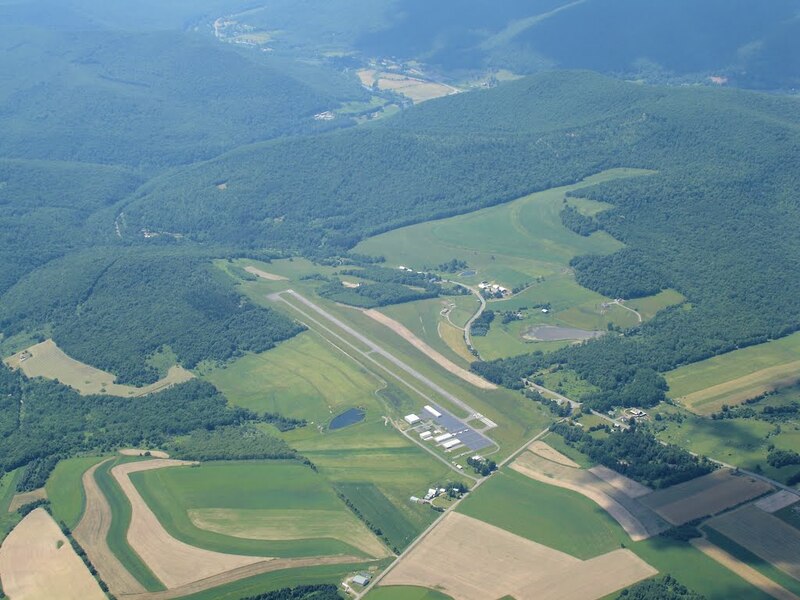 This is the Wellsboro-Johnston Airport, also known as Grand Canyon Airport, in northern PA. Though I did not stop here today, this is a neat place. Perched atop a hillside at almost 1900 feet elevation, it is in a different environment from the flatland airports in Michigan or the greater Rochester, NY area. Sure, it's not exactly one of those crazy mountain runways with such a slope that take-offs and landings can only be done in one direction, but the runway is definitely higher than the immediate terrain. Run by an affable guy named Wes McKinney (and his co-managers, Ginger, Pratt, and Whitney), this little airport is on the edge of Pennsylvania's Grand Canyon. It's a great stop for inexpensive fuel (relatively speaking), great conversation (about airplanes, of course), and an opportunity to drool over Wes' immaculate T6 Texan.